First of all, stupid Blackhawks... what a pathetic showing... first round elimination at the hands of the Nashville Predators with nary any offense to speak of. That was just not a pretty series. I need a good palate cleanser. Luckily, Peter from Baseball Every Night recently commemorated the first anniversary of his stellar blog (congratulations, Peter!) and the celebration of which includes a contest based around a fun and thought provoking writing prompt. I love a good writing prompt! The concept here is to show off your favorite card of your favorite baseball player of all-time - sounds simple enough, right? However, there's a small twist (not M. Night Shyamalan-level, but a twist nonetheless): the card selected must be book at less than fifteen bucks. We're not looking for "mega mojo hits" here, just your favorite baseball card of your favorite baseball player. The guidelines here shouldn't be too hard for me to follow, seeing as I'm a decidedly low-end collector and it would be tough to find any cards worth more than a couple bucks in my possession. Therefore, I've decided to add a little extra challenge. Instead of simply showing off my favorite of favorites, I'm going to do a top five countdown. This allows me to rack my brain a little more, milk the post concept for all that it's worth, and show off a few more cards that haven't made it from my binders to the internet just yet. While I've waxed poetic about Mark Grace, Ryne Sandberg, and even Sammy Sosa - the stars of my childhood - the king of kings in my baseball almanac is, without a doubt, Ron Santo. While his playing career had been over for fifteen years before I was even born, this belated Hall of Famer was a favorite of my grandfathers and it was he who imbued his love of the Cubs into me. Furthermore, Ronnie's struggles with diabetes, his perseverance and undying positive spirit, and his giving back to the community through ADA walks were a constant inspiration of hope and good faith, which made him an excellent role model. Of course, Ronnie is best known as the emotional color-commentator on the Cubs' WGN radio broadcasts. While he was not the best broadcaster, in the technical sense, and he was about as big of a Cubs homer as could be, one could not deny that the man was entertaining. His emotional outbursts, goofiness, and clumsiness in the booth paired perfectly with Pat Hughes' straight-man persona on play-by-play, making for a radio call that I'd often mute the television for. As an aspiring radio professional, this was another aspect of Ronnie that I glommed on to. Thus, good ol' number 10 is certainly my favorite baseball player to ever take the diamond. With that established, let's jump right into my countdown, shall we? Before we go, I just want to note that the IP autograph that you saw above is not being included in the list (story on that card here). While, uncertified autos might not generally be worth the requisite fifteen bucks, the John Hancock of a Hall of Famer still feels like cheating. The sight of Ron Santo in White Sox colors (even airbrushed) might seem bizarre and sacrilegious to many Cubs fans. However, I'm a big time fan of short-term stops - Ryne Sandberg in Phillies garb, Sammy Sosa in Orioles duds, Kerry Wood in Yankee pinstripes, Billy Williams in the bright yellow of the Oakland Athletics, etc. - I find such odd sights to be absolutely fascinating. 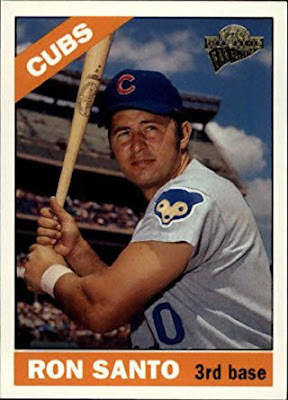 I'd say that Ron Santo, a Cubs icon and nearly a franchise mascot, in the uniform of their South Side rivals certainly qualifies. 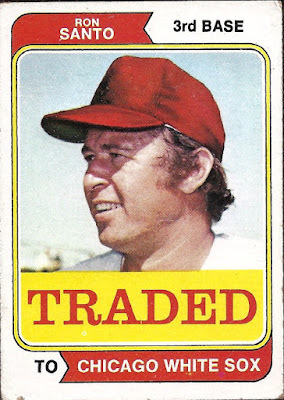 With this "Traded" card from 1974 Topps, we have Ronnie's only true, vintage White Sox card and it's attached fascination makes it an easy selection for this list. I hold no ill will towards our South Side brethren. As much as I love the oddity of seeing famous players in unfamiliar uniforms, I love the oddity of oddball trading cards. 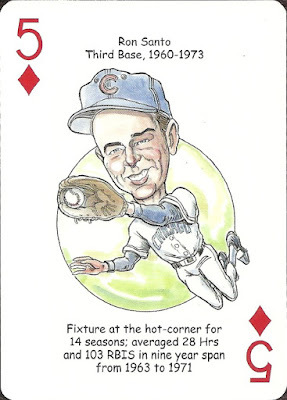 This five of diamonds hails from the 2004 Cubs edition of the recently-featured Hero Decks product, the caricatured checklist of which included Mr. Santo. Many thought Ronnie made a cartoon out of himself in the broadcast booth, so I guess this is somehow appropriate. The only way this artist's rendering could have been more apropos is if it depicted "This Old Cub" in the midst of his iconic heel-click, the way he celebrated each Cubs victory in 1969. 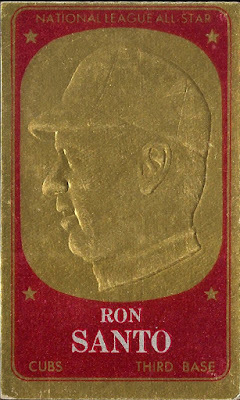 Speaking of oddballs, while the embossed All-Star cards of 1965 were produced by industry standard Topps, they certainly are "out of left field" when compared with other baseball cards of their era. These slightly slimmer than standard, shiny inserts have been often maligned for their susceptibility to chipping, odd size, and the profile portrait bearing only a passing resemblance to the corresponding player. Nevertheless, when I saw this card in the discount bin of my local card shop, many moons ago, there was no way I was going to pass it up. It's different and I like different. Not to mention, it was a shiny, vintage, unfamiliar card of my favorite player, as well. I'll bite on that every time. Three oddball cards in a row - this one of the team-issued variety. 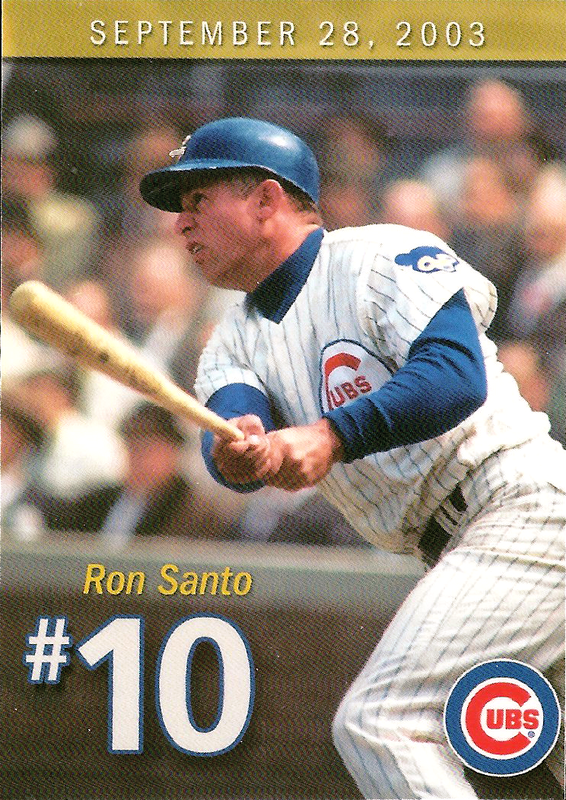 In 2003, with the Cubs having just clinched the NL Central Division title and just about to embark on a memorable playoff run, the Cubs honored Ron Santo by retiring his number 10. As part of his unjustly long battle to get into the Hall of Fame, Ronnie had been denied Cooperstown induction by the Veteran's Committee earlier in the year and this was the franchise's way of saying, "hey - you matter to us!" As part of the festivities, the team passed out these standard-sized trading cards to commemorate the retirement ceremony. 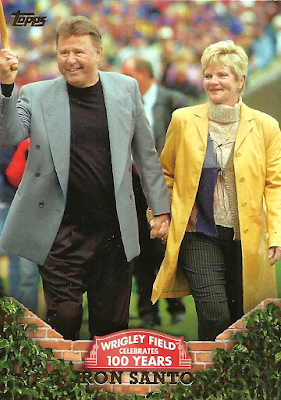 Santo appeared in a Topps product (along with his wife Vicki) for the first time in a long time, as part of their 100 Years of Wrigley insert set from 2017 Flagship. This card just missed my top five, but I'm going to take this opportunity to show it off anyway. Now, I was not so fortunate as to be able to attend this event and I picked this card up several years later at an antique mall in Volo, IL. That said, I remember attentively watching the event on television and the unfiltered emotion that came from Santo ("this means more to me than the Hall of Fame") left a lasting impact on me. Plus, it was the first number retirement of my lifetime. As such, this card is an easy selection for number two. A 2003 All-Time Fan Favorites single. This reworking of Topps Archives used the same basic concept, cards done in the style of classic Topps sets but with different photographs. Especially in today's retro-crazed card market, this technique is overdone and wholly uninteresting; however, this card will always and forever stick out to me. 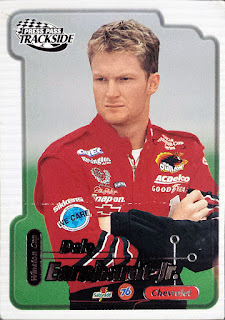 You see, it was this very card that got me back into baseball card collecting. 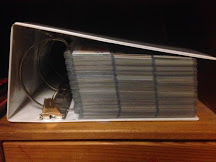 When I was a child I built my baseball card base; but, when my grandfather passed away, the cards were shoved into boxes and banished to the back of my closet. We all grieve in our own way I suppose. 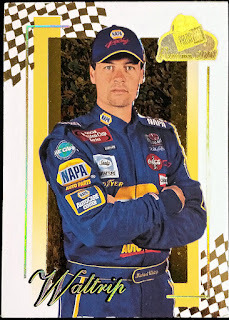 In the ensuing years, my focus shifted from our nation's pastime and onto NASCAR racing and my card-collecting habit transferred over to that sport. Until I was mid-way through my teens, all I collected was NASCAR cards and memorabilia; baseball stayed stashed behind my forgotten t-shirts and beat up running shoes. 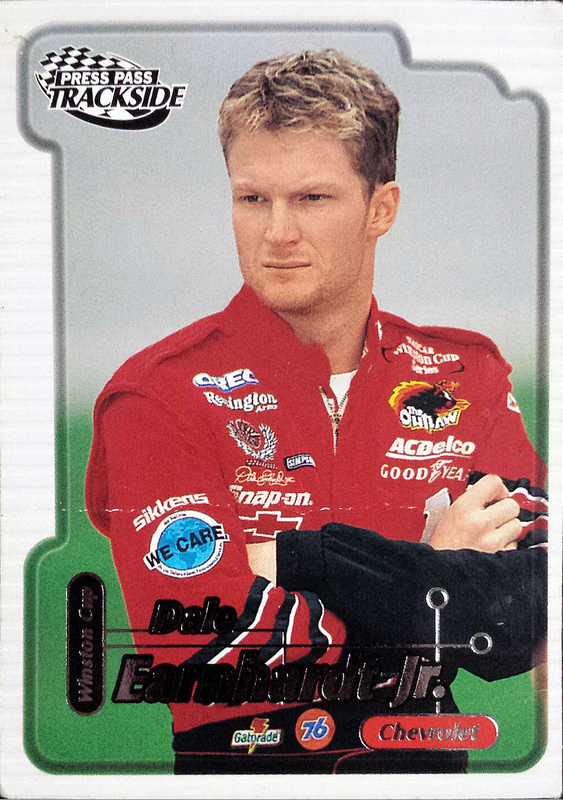 For a long time, these were the only kinds of cards that I chased. Then, one day, my mother decided to stop into my childhood LCS (RIP Double Play Sports Cards), for old-time's sake, and picked up the ATFF card you see above. Like I said, he has always been a familial favorite. When she brought it home, the blue sky, the clean photograph, the awesome Cubbie bear sleeve patch, and those glorious sideburns reminded me how much baseball once meant to me. Within a few days, those old boxes came out of their thick coat of dust and, just like that, back into baseball I did delve. 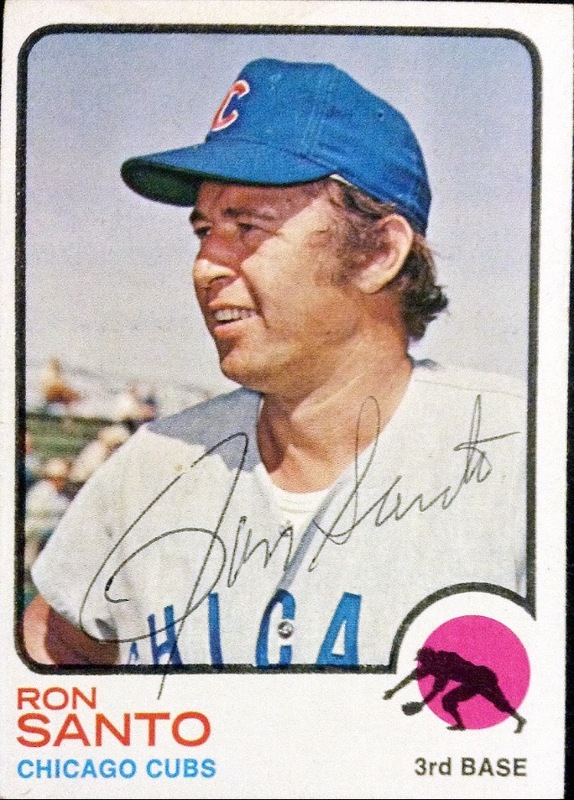 In short, this Ron Santo card is responsible for my rediscovery of baseball and baseball cards. While it's quite a nice card in it's own right, what it represents makes it impossible to pass up for the number one spot. 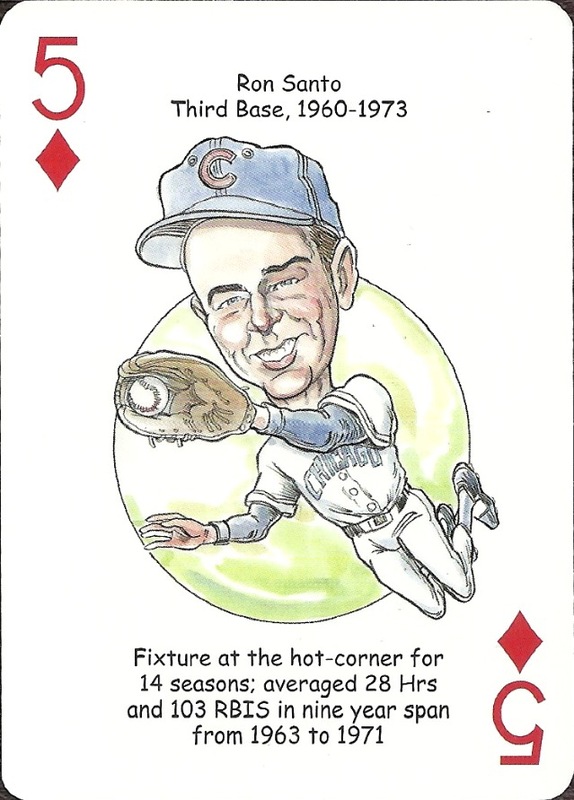 So, there you have it - my favorite card of my favorite player of all-time, along with a gaggle of other neat Ron Santo cards. I hope you enjoyed this wild ride. I also highly encourage you to participate in Peter's challenge along with me - the prize is promised to be exceptionally unique and picking out my favorite card turned out to be a notably fun diversion. Plus, I'm curious to see everybody elese's selections. Bang out your post and drop a link on Peter's original post and *BOOM* you're entered. What's your best of the best? What an awesomely great post, Tony. The drumroll kind of had me laughing a bit as I wasn't sure it was ever going to end! But, the story behind Santo being your favorite player and the role that your number 1 card played in your life was pretty freakin' moving. A spectrum of a emotion in this neat post. Thank you so much for participating in the contest. Wish I owned more Ron Santo cards. I think my favorite would be the 1964 Topps Giants card. Great list! Love the Santo Fan Favorites card -- I have yet to pick up a copy for myself -- and thanks for sharing the story behind it. Every collector has those one or two special cards that remind them of why they got into (or back into) this hobby. P.S. 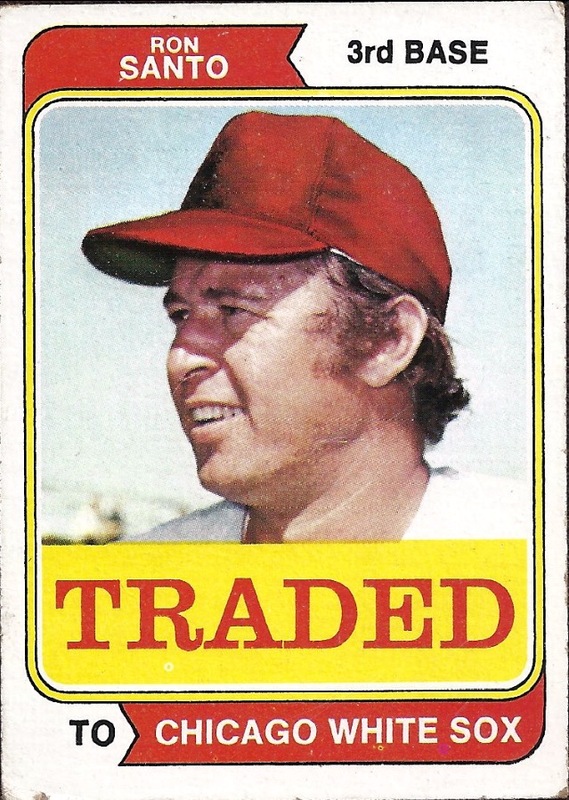 -- Ronnie also has a White Sox card in '75 Topps.